Our school year is off to a fabulous start (other than first-day toddler training)! 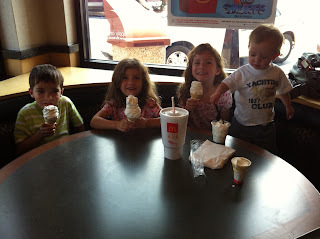 To celebrate our first day, once we finished, we went to McDonald's for ice cream! We all love History - our breakfast table subject - and we've started with Story of the World 4 this year. I have modified the material covered to expand the time we will be studying the Civil War (or the War Between the States as some of my friends are apt to say) and World War II. I've decided that we'll skip things like the Vietnam War and the couple of decades between the collapse of Communism in Europe and 9/11. The kids always enjoy the projects that go along with any given lesson - and this week's project was no exception. We made Enfield cartridges and compared the time to load an Enfield rifle versus loading a Brown Bess. Richard, our resident gun enthusiast, was more than happy to help make cartridges made of flour, wax paper, and tin foil, then load them into paper towel rolls! Our other breakfast table subject (History gets 2 days, Science gets 2 days) is Elemental Science - Physics for the Grammar Stage. We explored states of matter with three experiments! Richard has been enlisted to help us do our projects this year and he seemed to enjoy lending a hand. Now that Casey is in fourth grade, she is using Saxon 5/4. What a blessing! A year ago, thinking of what this year would be like with 3 kids doing different levels of math, I was struggling with the idea that school was going to take us 9 hours a day simply because of all the time spent on various maths. However, I bought the Saxon Dive CD and Casey has a more self-guided approach to math this year. Of course, I check over her work and pop over to make sure she's understanding the concepts taught. Tricky is learning how to read. I used "Teaching Your Child to Read in 100 Easy Lessons" with her older siblings, but I'm using "The Ordinary Parent's Guide to Teaching Reading" with the Trick. She needs some additional attention to the sounds letters make and the first 26+ lessons of OPGTR do a wonderful job of it. In addition to learning to read, Tricky will start Kindergarten Math (Saxon) at the beginning of September. She asks daily if she can start it, but I'm holding off until I get into the groove [I can't deny that Madonna - not the Blessed Mother - popped into my head as soon as I typed that] with everything else to introduce Math to Tricky. I took Latin off our plate not far into last school year. I've replaced Latin with Spanish this year. So far the kids love it. I may spend 2 or 3 years on Spanish then tackle Latin again. There was just too much of a learning curve for me with Latin and, given my schedule and the fact I have NO TIME to learn Latin right now, I opted for a language I'm more comfortable with. We are using "Learning Spanish with Grace" - a Spanish program developed by a Catholic mom. I'm looking forward to taking the kids to a Spanish Mass once we learn more vocabulary and prayers. Well, I'm off to work on organizing all of our materials and making a plan for our weeks to be spent on the Civil War. Good luck to everyone starting the new school year! That's the ONLY flour I use now - even for loading paper towel-aluminum foil ball- flour powder home school 19th century rifles! toddler training...ha ha! I know what that means! You are surely a ballerina...always on your toes~! Nothing like McD to wrap up that first day. Good luck back at at ya on the start fo your new school year.